Hello again from The Blundon Bourbon Review. 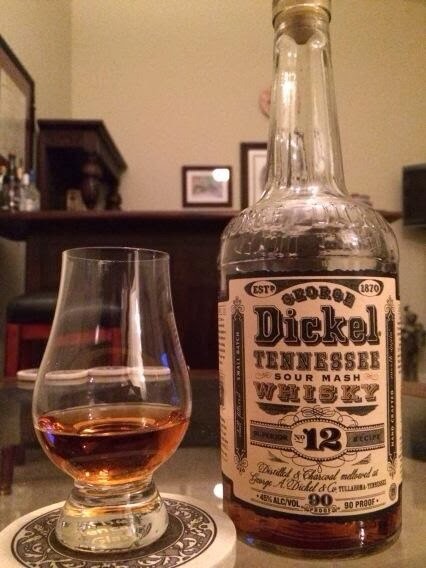 Up for review tonight is George Dickel No. 12. Before I get started, let me state this is not a bourbon, but a Tennessee sour mash whiskey. Nose- Corn. Sour apple, Vanilla, Butter, Oak. There are some floral notes here. Taste: (Neat from a Glencarin Glass) Green Apple candy takes over my pallet, followed by sweet corn, honey and mint. Notes of maple, butter, and oak linger. Finish: Smooth, soft and long. Lots of corn. After a minute I still have a sour apple taste on the tip of my tongue. Conclusion: George Dickel uses a unique chill-filtration process that is said to produce a very smooth product- for which I must agree. I really enjoyed this pour. I spent my childhood and teenage years in Tennessee, and this makes me proud to call it my former home. This has a very unique flavor profile that comes together very well, and for the price, I highly recommend it.